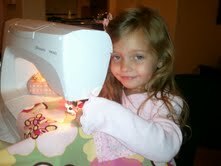 My daughter just turned 5 a few weeks ago and has been asking to sew. really wanted to make something. As you can see in the corner of the pic Mark was not far behind, he kept putting his hand on the fabric as it was being sewn as if he was helping make something too! Sophia picked out this darling fabric and we got straight to work. She had so much fun sitting on my lap and sewing. She is so dang cute!! and very proud of what she made. She took it to preschool to show everyone her beautiful work. Cute apron and even cuter seamstress. Way to go Sopia!